I originally shared this blog post on April 7, 2013. I still cringe at the thought of making this journey by myself. When my girls were young, one of their favorite movies was “The Neverending Story”. I experienced the never-ending drive. This story was originally in my book but didn’t really feel like it belonged where I had it and never really added enough to the story so I deleted it from the manuscript but saved it. It is another funny story similar to the one titled “Can I help you Ladies?”. This story starts out with me and my daughter Laura (the same one in the story above). I chose the Never-Ending Drive as the title for this post and you will understand once you get into it. A few days before the students were to arrive at school, my younger daughter Laura was scheduled to leave for college in San Francisco. My husband was not able to take time off from work so I took the day off to drive her. The night before we were to leave I helped her load the car and trunk as full as we could. My husband and I would drive up again over the weekend and deliver what was left behind. I prepared myself by printing directions to her dorm. I had made the trip before with others but had never driven there myself. I was going to rely on my daughter to help me with the directions. I had not been feeling well and was extremely fatigued I drove to my daughter’s house to pick her up early in the morning. She was very tired. I am sure that she had not slept much in anticipation of the move. We drove through a fast food restaurant to get her some food and coffee. She was not feeling well and soon fell asleep. Occasionally I would wake her to see if we were going in the right direction. She did not know. My plans were to take her to school and hang around until about 7:00 p.m. so that I would not have the heavy traffic to compete with on my drive home alone. We arrived at the campus and carted all her belongings up to her dorm room on the second floor. Exhausted, we both tried to set up her computer. To our dismay, we could not get a connection. After making a few phone calls, we learned that she needed to take her computer downstairs to an office to have a special component put in it and she needed a certain cord to hook it up to the school’s line. Laura wasn’t feeling well and wanted to sleep. She had injured her back earlier and could not carry the computer. So, I picked up the tower and made the trip to get it fixed while she slept. I was told to pick up the tower in a couple of hours. By the time I got the computer fixed and back to her dorm it was nearly 6 p.m. I woke her up and visited with her for an hour and then decided to make the drive home. The goodbyes were hard for both of us. She was now in San Francisco with no car and not really knowing how to get around town. She was worried that she would not be able to find her way around. I was upset because I was leaving my baby in a strange city and would be a two and a half hour drive from her if anything should happen. Reluctantly, I got in my car and drove off, both of us in tears. I reversed my route and headed for home. Things were going well. I had been nervous about driving home by myself in the evening especially because I was not that familiar with the area. The sun began to set and brought with it unexpected challenges. The glare made it difficult to read the road signs and the traffic was worse than I thought it would be at this time of the day. I was supposed to take a certain highway number towards home, but there were two of them. One said east and one said west. I was confused and there was not much time to make a decision because the traffic was bumper to bumper. I chose the one that had Oakland written on it. That turned out to be the wrong decision. After a few miles I began to realize that nothing looked familiar. It was dark by now and I was not about to get off the highway to ask directions. I was in an area that was not familiar to me and there were not any major gas stations or restaurants that I could spot from the road. I continued to drive. The next thing I knew I was crossing a bridge that I knew for sure I had not crossed on my way in. It was a toll bridge and under construction. Hesitantly, I paid the toll and crossed the bridge. I was hoping that I could find some road sign that would give me a clue where I was or where to turn. My fatigue and exhaustion had become almost overpowering. I wanted to cry but controlled myself. I had to get home. I thought about calling my husband and asking for help but how could he help me if I could not tell him where I was. There was still some time before I was expected to be home so I decided to wait until I could offer some explanation of where I was. I drove and drove. Finally, I saw a sign that read Sacramento. Hooray! If I could get to Sacramento, I could find Hwy 99 and make my way home. Another hour passed and I was in Sacramento and had found my way home. I needed to phone home but did not want to admit that I was so horribly lost and that it would be another two hours before I got home. My husband was worried. He asked me how I could have gotten lost since I had very good directions. I told him that I did not know and promised to keep in touch as I drove home. Nearly out of gas I found a station that looked to be in a safe area and pulled off the highway. There would have been plenty of gas if I had not decided to go “sightseeing” instead of driving straight home. Sometime between 11:00 p.m. and midnight I made it home, a little over four hours after I left San Francisco. Exhausted, embarrassed and hungry, I crawled into bed. Early the next morning, I got up, got dressed and headed for work as usual. That weekend my husband and I took my daughter the rest of her things and took her grocery shopping. On our way home, my husband asked me to try to remember which exit I had taken. In the light of day, I easily discovered what I had done wrong. The exit I had taken actually took me in a circle and then in a direction completely opposite of where I was headed. The trip from hell was not one I would ever forget or one that I would ever want to repeat. I have never made that trip by myself again! 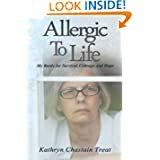 I need to explain that a few months earlier I had been on so many medications that we had stopped everything, including my thyroid, to let my body calm down and see what would happen. My thyroid was a mess and I had just started taking medication again a few days before I made this journey. I was fatigued and sick. The drive from here to San Francisco still scares me now so much that I wouldn’t dream of attempting it myself. Have you experienced a never-ending drive that leaves never wanting to do it again? I know this feeling well! Well I have finally run into the wall so to speak. My body hurts like the flu (but I know it isn’t the flu). I know this feeling all too well. It happened when my husband had his heart attack and by-pass surgery. I was making the same hour-long drive to and from the hospital day in and day out to make sure he was okay. My sister is taking mom today. I will ride up later with my daughter (she is driving) because she has an appointment near the hospital. I will pop in and come back home. I am spending the morning and most of the day just resting. I tried going to bed to see if I could sleep but that wasn’t happening (most likely because I slept soundly all night despite what my body is telling me). I just poured myself a cup of hot green tea and will just sit and clean out my email. This doesn’t require any unusual energy expenditure and I am sitting (not cleaning my dirty floors that haven’t been done in the nearly two weeks dad has been in the hospital, not cleaning toilets that need cleaned, or doing any other household chore). Sitting here quietly is keeping me engaged and my mind busy enough to override the intense desire to clean house. Keep me in your thoughts. I actually have some ideas for posts which, if my mind will allow, may get drafted today.